Hyundai has announced a series of changes to the i30 and i40, with the headline car being a brand new range-topping i30 Turbo edition packing 186PS. The i30 Turbo gets all that horsepower from a 1.6-litre turbocharged engine, pushing it to 62mph from standstill in eight seconds flat. The new engine dishes up a one third increase, more or less, in power and torque over the 1.6-litre ‘Gamma’ petrol engine that sits below it in the range. To enhance drivability, the Turbo gets stiffer suspension and sharper steering, while a new body kit including 18-inch alloy wheels ensure it also looks more purposeful than the average i30. Changes elsewhere in the i30 range include the addition of a seven-speed dual clutch automatic transmission, now optional with both versions of the 1.6-litre diesel (110PS and 136PS), plus all engines are now Euro 6 emissions compliant. CO2 emissions are as low as 94g/km in the case of the 1.6-litre 110PS diesel, while the lowest emitting petrol, the 1.4-litre with 100PS, emits 129g/km. The current i30 was only launched in 2012, but Hyundai has seen fit to refresh the looks very slightly already, with changes including a new hexagonal grille (putting the i30 more in line with other cars in the range, including the brand new i20), some new wheel designs and a trio of new colours. White, orange and black, basically. On sale from early next year, the changes apply to all three body styles: three-door, five-door and Tourer. There are no prices yet, but expect slight increases on the current model, meaning around £15,000 upwards. 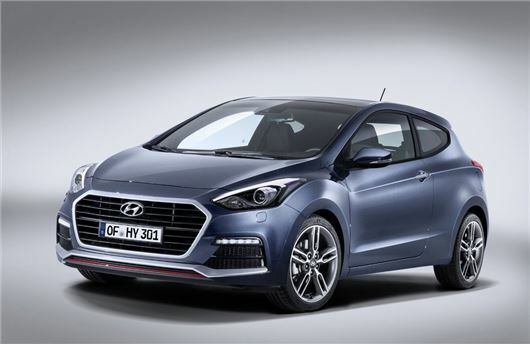 Completing a trio of product announcements from Hyundai, including this and the unveiling of the new i20 Coupe, Hyundai has updated the i40, pictured below. Similar to the changes for the i30, the i40 has undergone a grille transplant and now has the twin-clutch automatic on its options list. The range's popular 1.7-litre diesel, available with either 115PS or 141PS outputs, is now Euro 6 compliant, while Hyundai claims that the ride and handling characteristics are improved by the inclusion of new Advanced Traction Cornering Control and Rear Electronic Damping Control systems. This raft of product announcements gives substance to Hyundai’s so-called ‘Product Momentum 2017’ plan, which will see the company either create or enhance 22 product lines by 2017. So, that's three down and 19 more to go. Exciting times ahead.